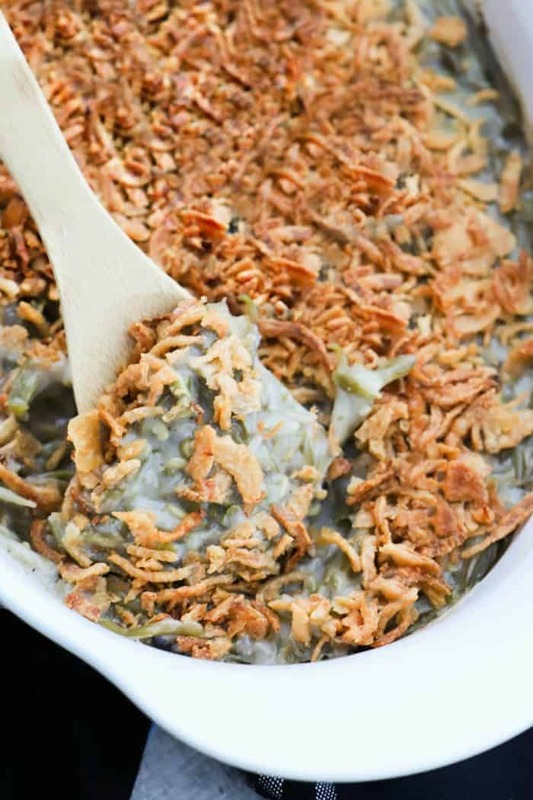 The BEST Green Bean Casserole and so simple to make. With just three simple ingredients and some seasonings, this dish is the perfect side. 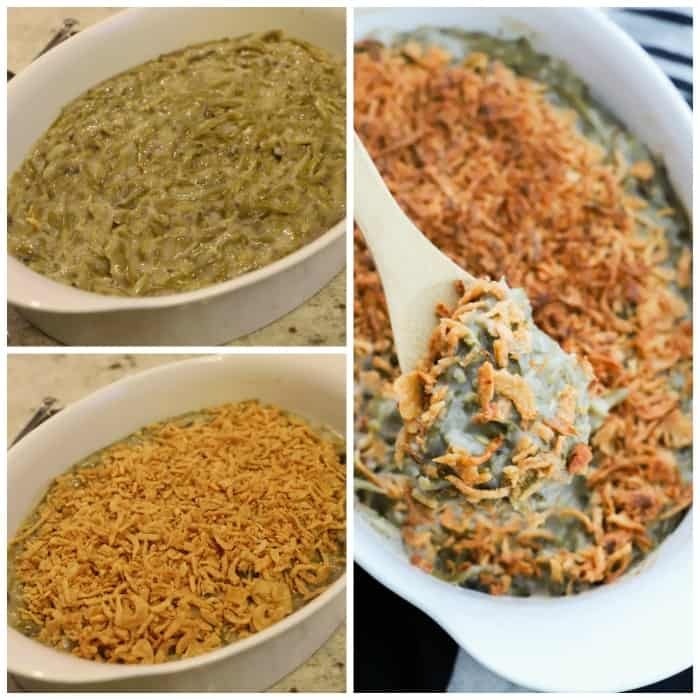 Green Bean Casserole is a classic! It’s a recipe my mom made every holiday and some of my favorites. Then though growing up my mom never put the French fried onions on top since she never liked them. After I was married though my husband suggests that I add them as his mom did and we brought I LOVED it with them. Something about the crunch that makes it taste so good. This recipe is nothing fancy and it’s really simple to make but it tastes amazing. 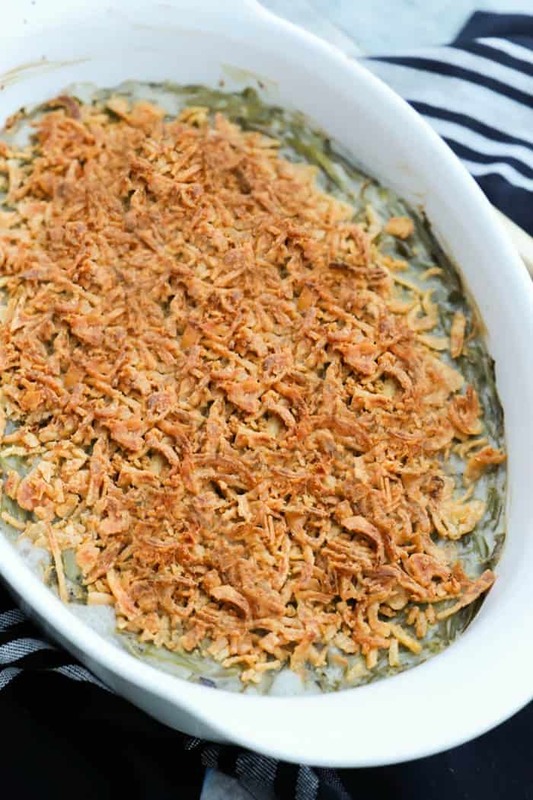 This recipe is the most basic green bean casserole but it still tastes amazing. It’s simple to make and totally foolproof and honestly one off y favorite ways to make it. 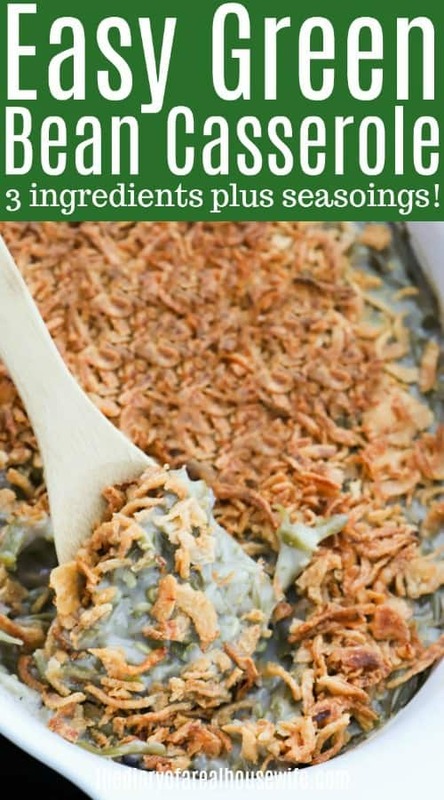 You only need three simple ingredients plus some seasonings to make this dish! French style green beans: You could use any style but after testing I found the French style to taste and bake the best. I used them out of the can and drained the water in the can. Cream of mushroom soup: You can sub this for a homemade version of cream of mushroom soup. You can also use cream of chicken or celery for the same texture but you will get a very different taste. French fried onions: I used an entire jar on top for this recipe. Step one: Preheat your oven and then prepare a casserole dish. I used a 9×13 oval casserole dish. Step two: Open your green beans and drain the water. Next mix green beans and cream of mushroom soup together. Step three: Next add in seasoning and mix again. I used about 1/2 teaspoon of salt and 1/8 teaspoon of pepper but you can add these to taste. Step four: Add this to the casserole dish and top with French fried onions. We used the entire 6 oz on top. I like to keep them crunchy and find that mixing them in gets them soggy during baking. If you prefer you can mix these into the casserole dish and bake. Step five: All you need to do now is bake. I baked mine for about 20 minutes until the casserole was warm throughout. Mixing: When making this casserole I like to mix my green beans and soup together in a mixing bowl then adding it to there casserole dish. This dish can get pretty messy to mix inside the casserole dish. The messy sides usually tend to burn so and mixing it a bowl will help with that. Make Ahead: This dish makes the perfect side for a big family dinner or holiday dinner. It’s so simple to make the day of but you can mix up the day before if you need to. I would mix and cover and place in the fridge overnight to bake in the morning. I would not add the French fried onions until it’s time to bake to make sure they do not get soggy overnight. If you are leaving it in the fridge overnight I would add an additional 5 minutes for cooking. Mashed Potatoes: These are the BEST mashed potatoes ever. For real, you have to try them. Cheesy Corn Casserole: This one is another must try. It’s so simple to make and taste amazing. Sausage and Herb Stuffing: I love stuffing for the holidays and this one is my favorite. So much flavor! Preheat oven to 350 degrees F. Prepare a casserole dish with non-stick cooking spray. Mix green beans and cream of mushroom soup together. Add seasoning and mix again. Add this to the casserole dish and top with French fried onions. Bake for 20-25 minutes. Serve and enjoy.